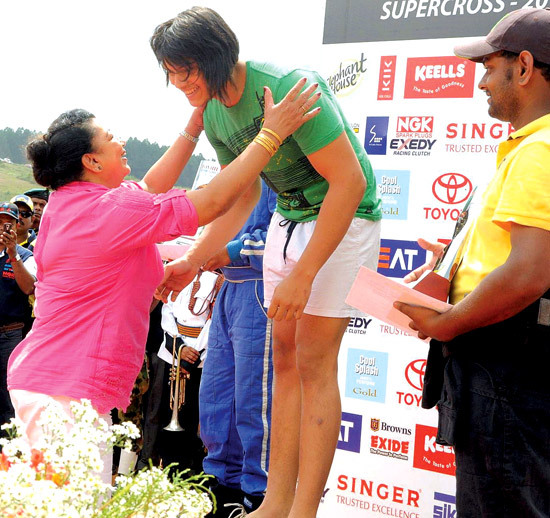 First Lady Shiranthi Rajapaksa congratulates her son, Rohitha Rajapaksa who won the Group SL-N Nissan March up to 1000 cc event. CRICKET: Sri Lanka’s and World’s champion spin bowler - the “Doosra” specialist Muttiah Muralitharan has something to ‘crow’ about in his retirement. He is the highest wicket-taker in both forms of cricket - Test and limited-over games. CHENNAI, India, April 16 (AFP) - Michael Hussey cracked an unbeaten 83 off 56 balls to set up Chennai Super Kings' 21-run victory over Royal Challengers Bangalore in the Indian Premier League (IPL) on Saturday. NEW DELHI, April 16 (AFP) - A Sri Lanka Cricket Board demanded that national players involved in the Indian Premier League (IPL) return to prepare for an England tour has reopened the long-running club versus country debate.